All the goals came in the second half and all of them went to Newcastle. The same sort of chances that came and went in the first half came and were taken in the second to give United the perfect pick-me—up after a 5-o beating at Chelsea. Following a 28th-minute collision between Shearer and City’s England goalkeeper David Seaman, Seaman proved he had recovered with a sprawling save from Laurent Robert, though he would surely have had no chance had Shola Ameobi and Kieron Dyer hit the target from good positions. But in the 56th minute all that was forgotten as Ameobi put United ahead. Climbing at the far post with Steve McManaman to a Robert cross, Shola was first to react as the ball dropped, and poked it past Seaman. In the 76th minute, Jermaine Jenas, fouled as he did so, fed Olivier Bernard on the left. Referee Neale Barry waved play on and Bernard’s subsequent cross was a dream for Alan Shearer, who moved in to bullet a close-range header high into the City net. 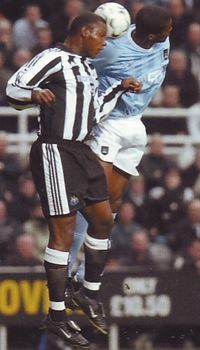 Six minutes from the end Ameobi headed down a Bernard cross and Shearer, although blocked the first time by Seaman, forced the rebound over the line.